The Atacama Large Millimeter Array (ALMA) has captured a spectacular view of Betelgeuse. Also known as Alpha Orionis, Betelgeuse is a red giant star located within the visual bounds of the constellation Orion. This is one of very few stars large enough to be seen in a picture as more than simply a blip of light. Betelgeuse is 650 light years away and only rotates once every 8.4 years. It is also an incredibly large star at 6 AU (half a billion miles) in diameter. 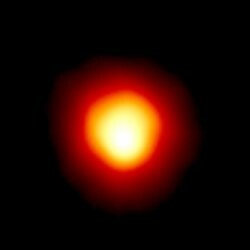 The first measurement of Betelgeuse was taken by Albert Michelson in 1920 using the Mount Wilson 100-inch. The initial diameter taken came in at 240 million miles, only about half of today’s accepted diameter. When seen from earth, however, the star only appears to be 50 milliarcseconds across. 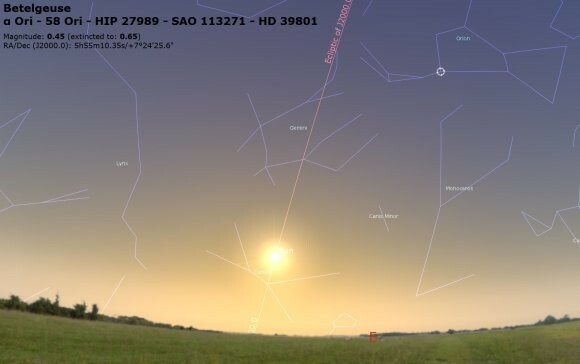 Betelgeuse’s current apparent diameter is one of the largest of any star in our night sky, which is only beaten by R Doradus (57 milliarcseconds across). 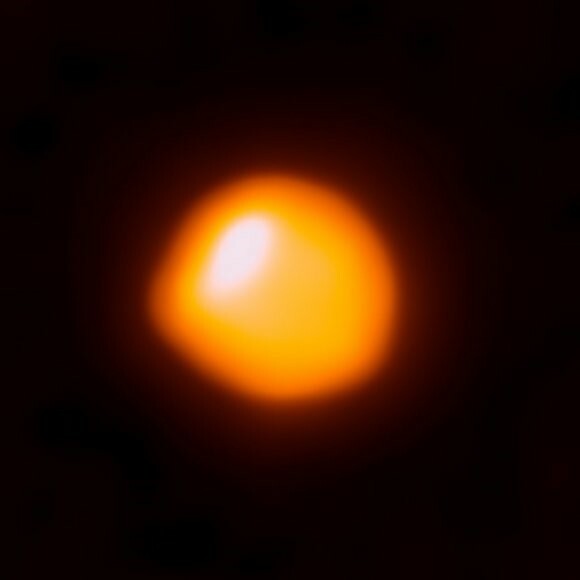 In the image captured by ALMA, an asymmetrical bubble is seen rolling across Betelgeuse’s surface. 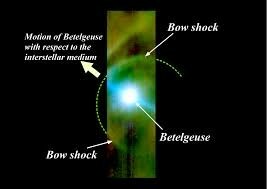 Infrared surveys have shown scientists that Betelgeuse is actually surrounded by a bow-shock, which is created by the stellar wind coming from Betelgeuse and the gas in the interstellar medium interacting with each other. This will one day result in a brilliant light show to be seen from our very own planet when the star ultimately dies. At eight million years old, Betelgeuse is quite a young star, considering that our own Sun has been around for 4.6 billion years. Although Betelgeuse is considered a young star, it is destined to die in a massive supernova in the next few thousand years or so. Luckily for us, Betelgeuse’s death will be out of the supernova “kill zone” by 25 to 100 light years. The massive star’s death will serve as an important nearby supernova candidate (along with the star, Spica, at 250 light years away) for astronomers’ future studies of the anatomy of a supernova explosion.